We’ve built a strong relationship with Bedford Borough Council. So, when they began developing four brand new villages – The Wixams – they, and Bedford College Academy Trust (BCAT), asked us to design a cutting-edge science and technology academy as a centrepiece for the new community. Offering 100 secondary school places per year with a 324-strong sixth form, it’s a £13 million project delivered in partnership with Willmott Dixon, Pick Everard and Scape. With a tight schedule and lots of stakeholders, this project had to be on site fast. We worked closely with Bedford’s planners and everyone involved to make that happen. Crucially, we had to meet stringent Education Funding Agency compliance to secure project funding. Achieving it was a major milestone – few school builds do – and meant this national flagship project could go ahead. Forming the centrepiece to a new housing development, it was crucial for the facilities at Wixams Academy together with its sister primary school, to serve the community as a whole. Understanding that this new learning community was not only physically but emotionally at the heart of the new village, we undertook an extensive community engagement programme right from the start. From the start, we worked in collaboration with the planners and representatives from the local authority as well as the new academy’s leadership team to ensure there were as few conditions as possible attached to the planning application, so the team could start on site as soon as the project received planning permission. The school sponsors, BCAT, had a clear vision for the secondary school to become a centre of excellence for science and technology. So, with this in mind our design for the academy includes a science super lab, heavy practical workshop, high-tech workshop with 3D lathes, creative design studio and recording studio. We designed a learning resource centre at the heart of the school, extensive sports facilities and an entire second floor dedicated to the sixth form. Outside, a threshold piazza links local walkways, creating a safe, open space for the whole community. As well as fulfilling demand for much needed school places, the project has been a success due to the collaborative approach adopted by all the stakeholders involved. 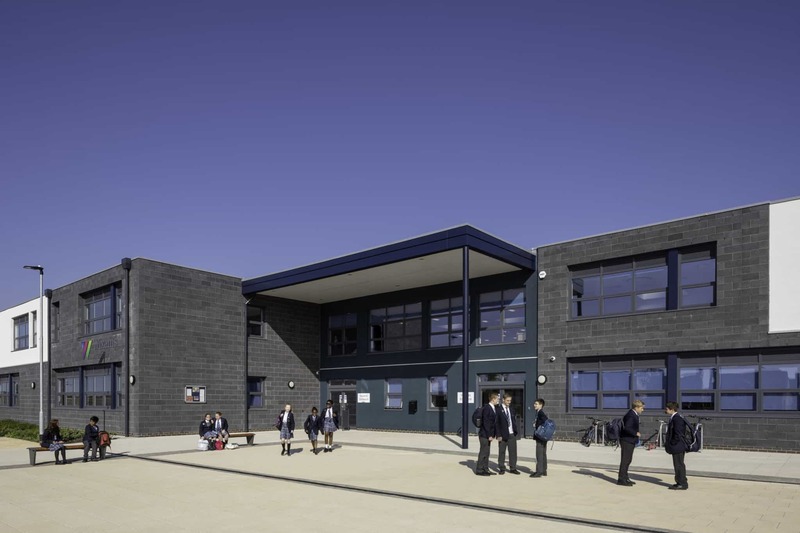 We had a shared goal which was to design a school to the Facilities Output specification and deliver it within the rates required by the ESFA. We’re proud to say that the scheme met these conditions and was delivered within a very short programme, on time and on budget. But most of all, it’s the positivity and pride that we’ve witnessed within the school, which is evident in the smiles of the children’s faces. The teachers have commented that the beautiful, fresh environments will undoubtedly influence learning in an aspirational way, encouraging the children to work hard and aim high.